Coaxial Cable RG6 / 64 CCS central wire plus Al shield RG6 / 64, central CCS plus Al screen and Al braid. Coaxial cable RG59 Coaxial cable RG59 with CCA conductor and CCA shield. Coaxial cable RG59U/64Al, Cu + Al Coaxial cable RG59U / 64 Cu core cable and Al casing. Coaxial cable RG6/96, CCS Coaxial cable RG6 / 96 with CCS 20% cable for high-frequency signals suitable for television antenna. 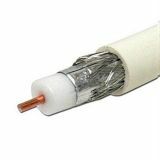 Coaxial cable RG6CU/64 Coaxial cable RG6CU/64 with copper wire. Coaxial cable RG11, with CCS center conductor Coaxial cable RG11, with CCS center conductor, APA+TC shield. List Price 0.35лв. VAT Incl. 0.33лв. VAT Incl. 0.31лв. VAT Incl. List Price 0.99лв. VAT Incl. 0.94лв. VAT Incl. 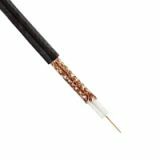 Coaxial Cable RG6 / 64CU Cu + Cu High quality antenna cable, RG6 / 64CU 1.02 copper (Cu) a central conductor and a copper (Cu) casing. 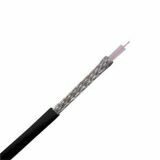 Coaxial cable RK-75-1.5-11, 75Ohm Coaxial cable RK-75-1.5-11, 75 Ohm. 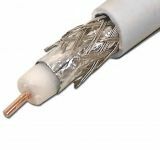 RF cable RG-174 copper core cable Coaxial cable RG-174 with multi-core Cu core conductor and tinned Cu screen.